Honestly, I wasn't sure Staten Island could deliver on much else, gastronomically speaking, than terrific Italian food. It seems to be the stock in trade there, and while I've had reasonably good Spanish tapas on the island, a German beer hall seemed far-fetched. But this trip, two of our party were enthusiastic wurst freaks. So I selected Nurnberger Bierhaus for our dinner choice the first night in town. Killmeyer's is the more famous, better rated SI German emporium, but Nurnberger was on our way to the St. George Theater, so it got the nod this time. You enter through the bar, and trust me when I tell you that our pre-pageant squad was overdressed in a way that was noticeable to all the other patrons. Nurnberger's isn't fancy, but its dining room is homey and comfortable, like sitting in your grandparents' living room in 1978. 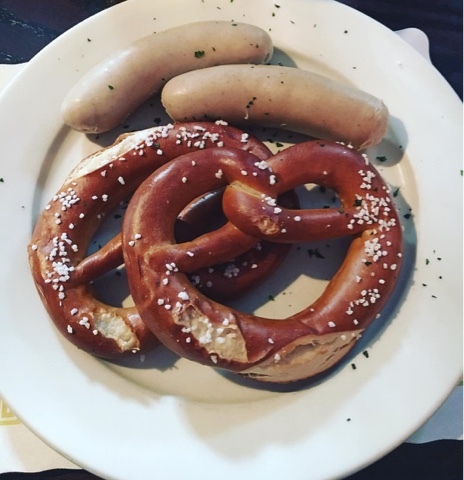 Though the menu boasts an impressive array of authentic German beers, our thickly accented German waitress was less than enthusiastic about reporting back to us each time we tried to order one, which they were out of. I really was looking forward to a Franziskaner, so when they didn't have it, it could have been my disappointment that turned her against us. Nevertheless, her scowl was a permanent fixture of our meal at Nurnberger. Undeterred, we finally ordered a beer they had in stock, and continued to peruse this old school, wurst-heavy menu that highlights dishes of central Germany like schnitzel, rouladen, and sauerbraten. They had a whole section of the menu devoted to proteins paired with, "little potato pans," or mountains of German fried potatoes with onions and bacon. Uhhhhh, OK. I'd like that, please. My order came with a starter salad, which was simple, but good! 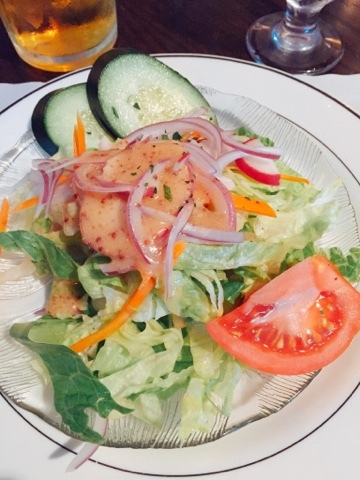 I liked the sweet and sour vinaigrette that came on it. The tomato wedge and cucumber slices were not plentiful, but they were perfectly fresh. I chose bratwurst to go with my little potato pan. For the record, there is regional cuisine in Germany, and Hamburg, which I visit for work each spring, doesn't have a lot of the wursts or roasts, but it does have potatoes with just about every meal. Germans know what to do with potatoes, you guys. They make them sing. In this dish, they were crispy, fatty, salty, and sweet. Like home fries on steroids. Like, you took a bite and then knew that your life might just be perfect after all. Like maybe the sourpuss waitress was friendly, after all. THAT is the power of well-cooked potatoes, friends. The two bratwursts were, first of all, huge. They were well-crisped on the griddle; the natural casing split open from the heat and crackling-crunchy. The meat inside was mild, tasting like white meat pork with a little garlic. They were definitely milder than a Midwest American-style brat, braised in beer. But with those incredible potatoes, honestly, they could have given me a pile of grilled shoelaces and I would have probably been ok with it. 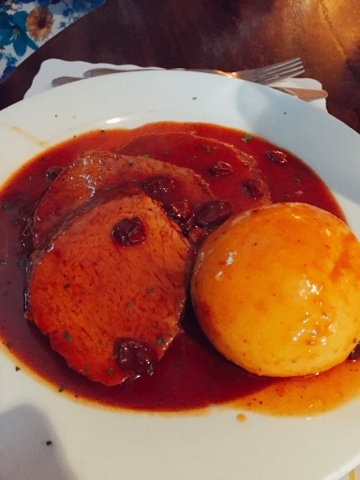 Mom got the sauerbraten, which I don't think I had ever had before. It was deep and rich, kind of like pot roast, but with an acidic edge - a sour note we don't specialize in in American cuisine. That vinegar kick is nice; its breaks up all the salty, earthy, meatiness in a long-cooked dish like a braise. The tender potato dumpling on the side was no slouch, either: like a magical ball of mashed potatoes that somehow stays together In a solid form, but without being gummy or gluey in any way. Dense and ethereal at the same time. Again, well done, Germany, you potato masters, you. This dish was served with a little side bowl of braised red cabbage, again, imbued with a little edge of acidity to challenge the sweetness of the vegetable. It was cooked down, but still retained a tiny bit of crispness so that you didn't get that icky cabbage-soup, flabby texture that overcooked cabbage has. 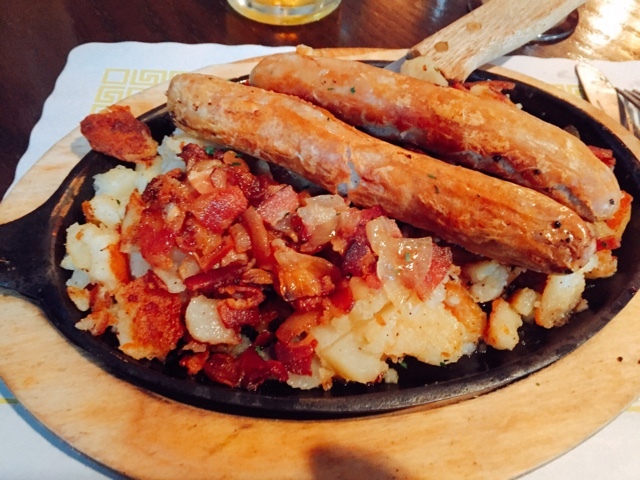 Morgan, our resident wienermaster, ordered two plump weisswurstteller sausages with two massive pretzels. This dish was hilarious looking and I can't believe it was on the menu like that: two white wieners and two big, chewy, brown pretzels. This is stoner food at its finest. Are these Germans secretly...Jamaican? Or maybe from German by the way of Colorado? The veal sausages were steamed, nice and juicy, not crisped like my wursts. The pretzels were dense and chewy, with just about the perfect amount of salt on top to flavor the whole dish. Morgan absolutely loved it. We had to rush out to make our show, so dessert wasn't on the menu for us this trip, but I can say that we liked the food enough at Nurnberger Bierhaus to get over the astounding degree to which our waitress seemed to wish to be anywhere else on planet rather than waiting on us. I give Nurnberger Bierhaus a six on the BHS scale - above average, if a little bit rough around the edges. At least four of those points are for potatoes alone. Go for the beer - stay for the carbs. Hmm, that could actually be Germany's new tourism tagline. My personality is big; my hunger is bigger! Yeah, the waitstaff can make or break the whole deal.